GALLERY WALK, Brattleboro, Vermont - A Monthly First-Friday Celebration! or advertising in our guide. on 3rd Fridays each month. Gallery Walk qualifies as a 501(c)(3) nonprofit arts organization through its association with the Arts Council of Windham County. in downtown Brattleboro, Vt. and nearby locations. GALLERY WALK IS ON FRIDAY, APRIL 5. NOTE: Most exhibits are open all month long. Call venues to confirm exhibit hours. Next month's Gallery Walk is Friday, May 3. Ongoing exhibits include a changing display offloral and landscape watercolors and oils by Sylvia Chun Yin Ryder, a native of Taiwan; also Ray Fiske's "Canvas and Steel" series and his 5-foot Tin Man;Alex Hrabchak's watercolors; painter Kristina Wentzell's flora, fauna, and landscapes; Tiffany Heerema's collages of vintage food imagery; Terry Carter's large painted gourds; Henry Ireland's fine art photography; Tina Olsen's botanical illustrations; Martha Dolan's landscapes and contemporary artwork; Janet Picard's mystical landscapes, studies in nature, and unconventional still lifes; and Deborah Lazar's impressionist-realist paintings. Walk "munchies" available 5-6:30. This casual waterfront eatery with sunset view is open daily 11:30-10, Sun. Brunch served 10-1. Open for Gallery Walk 4-6:30 pm on April 5; otherwise open year-round by calling ahead to arrange a visit.... NEW EXHIBIT: Putney School Dynamic through May 12. This 12-section montage celebrates the creativity, exploration, and passion of these Putney School faculty and staff: Sue Brearey, Brian Cohen, Gordon Jones, Naomi Lindenfeld, Rodrigo Nava, Kate Purdie, Andy Reichsman, Betsy Rogers, Donald Saaf, Cai Xi Silver, Lynne Weinstein, Le Xi, Julia Zanes.... Continuing exhibition: Fluxus Dialogue – Nye Ffarrabas (ex Bici Forbes Hendricks) and Geoffrey Hendricks (1931-2018), featuring Nye's new infinite event score based on Geoff's "Friday Book of White Noise" 1964-1969, the collaborative notebooks being shown in public for the first time.... DIM SUM CATERING by appointment; calling 1-2 days in advance recommended, (802) 257-7898.... Self-contained 3rd floor airBnB apartment with art all around: www.airbnb.com/rooms/7173206.... Asian Cultural Center of Vermont (ACCVT.org) presents WORLD TAI CHI DAY on Sat., April 27, at 10 a.m. with Cai Xi and Joey Carroll at The Common at Park Place. Contact Adam Silver at (802) 579-9088 for event updates. FREE ADMISSION from 5:30 on Gallery Walk night—memberships available at 10% discount; 5:45-6:30 on April 5 · ADVENTURES WITH SUPER BEE: Night at the Museum, featuring live dance performance, storytelling, and interactive creative play for the whole family. Super Bee leads tiptoe mini-tours for kids, 6:30-7:30. 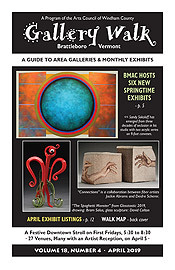 Reception and viewing of BMAC exhibits through 8:30.... 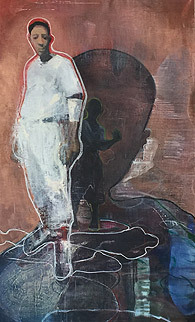 Showing through June 16 are Sandy Sokoloff: Emanation; Amy Bennett: Nuclear Family; GLASSTASTIC 2019; Joey Morgan: Catch + Release (2) Précis; Jackie Abrams & Deidre Scherer: Connections; and Joseph Diggs: Proud 2 Be American.... General Hours: OPEN 11-5, closed Tues. Admission: $8-$6-$4, Free: members & under 18; free for everyone on Thurs. 2-5 pm. Black-and-white photographs by Robert Cantius (b. 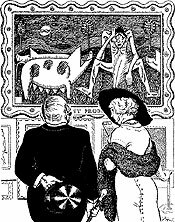 1938) are featured this month. 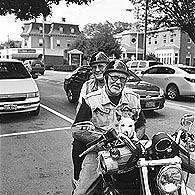 Bob spent nearly 60 years on a "photographic anthropological study" extending from his hometown of Paterson, N.J., through Western Mass. and north to Brattleboro and Bellows Falls, Vt. Inquiries can be sent to the Vermont Center for Photography—details at www.vcphoto.org. The Whetstone offers inspired food, local craft beers, and specialty drinks in a picturesque waterfront location with free parking. Lunch and dinner daily 11:30-10, Fri.-Sat. till 11. Gallery spaces in April feature a Printmaking & Encaustics Show. Printmaking classes cover a variety of techniques, including relief, monotype, silkscreen, and drypoint prints. The encaustic process includes layering wax and oil paint to create colorful montages.... GALLERY 34 features paintings by Cyndi Ferrante. Cyndi's paintings are abstract in nature, deriving their inspiration from the world around her. Continuing through APril 7, the Brattleboro Listening Project hosts activities to inspire thoughts about our community's shared values, needs, and solutions. Participate in an activity during Gallery Walk and meet folks involved—see Brattleboro Listening Project Facebook page.... LATE-NIGHT CULT CLASSIC FILM at 11 pm on April 5: "Army of Darkness"—admission by donation. Featured through June 2 is VCP's 2019 Open Juried Exhibition, featuring a broad range of photographic work, including both traditional and non-traditional approaches to photography. Guest juror Bruce Myren has selected eight participating artists from across the U.S.: Tom Condon, Elizabeth Ellenwood, Madge Evers, Forrest Holzapfel, Tira Khan, Marc Newton, Craig Schwanfelder, and Dawn Watson. Gallery Walk opening reception on Friday, April 5, 5:30-8:30. More information available on the VCP website. April features "Sarasota Incognita," an exhibit of paintings by Stephen Redmond. He began to paint in 1989, at age 40, and soon afterward built a 32-foot houseboat (named Gesso), sold his home in Burlington, Vt., and headed south along the East Coast to Florida. He spent time in Sarasota and Punta Gorda, and by 1995, docked for awhile 8 miles up the Peace River in a jungle-like landscape populated by alligators, turtles, catfish, and manatees. Steve painted these prehistoric creatures and the people in the places he worked. His paintings reflect internal subjects and personal visions as well. Reception on April 5, 5:30-9 pm. Gallery open Saturdays 12-4 and by appointment. 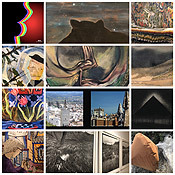 ONE NIGHT ONLY: A Gallery Walk Reception on April 5, 5:30-8:30, featuring light refreshments and work by artists represented at Gallery Sitka in Shirley, Mass. : Painter Melissa Richard (New Hampshire) uses abstract mixed media (textured papers, acrylic paint, and oil pastel) to interpret life, love, and complex relationships. Photographer Dawn Morton (Massachusetts) captures the unexpected day-to-day in documentary style, framing a moment that evokes an emotion and teleports the viewer to a place or sensation. Painter Dug Morton (Massachusetts) experiments with geometric abstraction, while painter Roberto Perotti (Italy) experiments with abstract expressionism. Painter Mia Scheffey (Brattleboro) uses mark-making to document her lifelong journey of inner transformation. Now featuring the work of Namaya—political posters, books, and music—with a performance reading at 6 pm during Gallery Walk on April 5. The ArtRageUs collective offers creative individuals the opportunity to join forces for selling art, crafts, books, and music. Check out the funky furniture, repurposed clothing, affordable prints, paintings, sculpture, and much more. The gallery is also home to the figurative furniture of Gayle Marie Weitz and to Write Action books. Want to sell your own artwork, book, or CD? Membership applications are available in the store and online. OPEN Fri./Sat./Sun. 11-5. THE LOVE SHEEP MINI-POSTER EVENT: Since 2015, Brattleboro resident, entrepreneur, and self-proclaimed "Ovine Artist" Walter Hagedorn has been playing with his tiny flock of plush "Love Sheep." Their silly sheep shenanigans deliver a daily dose of delightfulness to the rapidly growing fan base of "Sheep Peepers," spanning all ages and walks of life, both locally and globally! Select, affordable Mini Posters are available at the café for only $5.00 each! Find "THE LOVE SHEEP" on Facebook and Instagram for daily smiles. Rated "E" for Everyone, they are suitable for all ages. More info at www.thelovesheep.com. The café uses fresh, local, and organic ingredients. Open Tues.-Sat. 11:30-8, till 8:30 for Gallery Walk. Drawings by Corey Powell are featured in April, each frame a thrift shop find. "My artwork is drawn freehand on white paper using pencil for both the grayscale and color pieces. The bold outlines are done in black ink. I love to use shading or a lot of colors and patterns, while always maintaining some aspect of simplicity." Stop by to see the art and treat yourself to freshly roasted coffee, a seasonal drink, and homemade pastries. Open Mon.-Thurs. 7-8, Fri. 7-9, Sat. 7:30-9, Sun. 7:30-8. The record shop features a collection of vintage music and movie posters, several rare and collectible. Artists include the Beatles and solo projects, Bob Dylan, Jimi Hendrix, the Clash, Prince, Gene Wilder, Marilyn Monroe, Clint Eastwood. Turn It Up! sells new and classic music on vinyl and CD at bargain prices every day. Open Mon.-Thurs. 10-8, Fri.-Sat. 10-9, Sun. 11-6. An exhibit by Middle School students at Hilltop Montessori is featured this month. Their year-long immersion into the history of race in the U.S. included selecting a Leader of the Civil Rights Movement to research. The exhibit includes a charcoal portrait of each leader along with a carefully chosen quotation by that person. Students have also been asked to write a speech in the voice and spirit of their subject to recite during an April trip to Alabama The café offers European-style breads; soups, sandwiches, salads; specialty cakes, cookies, and other treats; open Mon.-Sat. 8-6, till 8 for the Walk, and Sun. 9-5. April Gallery Walk features oil paintings by Michael MacTavish and George Angelini as well as airplane sculptures by Karl Johnson. MacTavish paints impressionistic New England landscapes; Angelini's photorealistic oils focus on natural aspects of the landscape; and Johnson's sculptures are made from antique wooden planes, hence each is a plane-plane. Gallery Walk reception for the artists from 5:30 to 7 on Friday, April 5. A portion of sales by featured artists goes to the Craft Emergency Relief Fund.... Visit online or stop by 7 days to see work by over 300 artists. River Gallery School is exhibiting works from the Children's Subscription Art program that supports the Scholarship Fund. Framed original artwork created by children attending River Gallery School is loaned to businesses and members of the community for a year to hang in offices and homes. RGS is a 41-year-old nonprofit located at 32 Main St., Brattleboro. Call (802) 257-1577 for information, or visit the website for class offerings—rivergalleryschool.org. (See Walk listing #5 for current exhibits.) ... The café serves Rainforest Alliance coffee and humanely raised meats, poultry, and dairy with no antibiotics or added hormones; open daily 6 to 8, including for Gallery Walk. An ongoing exhibit of Dante Corsano's New Furniture is featured. Corsano's passion for woodworking began in 1972 with a playful exploration of wooden instruments and moved to a study of Japanese hand-planing and joinery. Hands-on experience with architectural renovations then expanded to a lifetime of creating one-of-a-kind furniture. Dante has won numerous awards and served the craft and artistic community as a compadre to fellow craftsmen and a mentor to younger artists. Recent pieces made in his new studio this year are available here exclusively ... and he still makes drums! Gallery Walk reception on April 5, 5:30-8:30. Open daily 11-5:30. Paintings and drawings by Susan Parenti are featured this month. Susan came to Putney as a single mother in the early '70s. A student of art in college and later in Italy and NYC, she continued painting through thick and thin. The work in this show includes recent and earlier pieces. Her work is meditative, in a loosely gridded format with closely hued color; each requires a lot of looking. Gallery Walk reception 5:30-7:30 on Fri., April 5. Otherwise open by appointment. Featured during Gallery Walk on April 5, 5:30-7:30, is Youth Services' annual Summer Camp Fair: Camp providers offer information for parents and activities for kids—see Youth Services' website blog at youthservicesinc.org/blog for info about the Camp Fair and their April 27 Gala Dinner & Dance Show fundraiser at SIT.... During April the Gallery is hosting the 15th Annual Young Children's Art Exhibit in celebration of the area's Month of the Young Child. Early childhood educators are displaying creations by the area's youngest artists. Special Opening Event for families on Sunday, April 7, 10-12, with fun, hands-on activities, refreshments, face-painting, and information on resources available for young children and families.... Open Mon.-Fri. 9-5 pm. Check River Garden 2019 website calendar for event updates. Accompanying the ongoing Ceramic Collective sho in the upstairs gallery is a returning exhibit of "Stitch Art." This collection of antique ephemera from the late 1800s includes colorful cross-stitch and embroidery patterns designed as supplemental inserts for The YOUNG LADIES' JOURNAL. 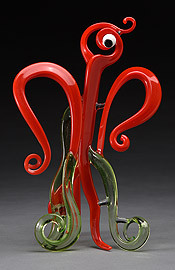 Stop by for a rare look at these beautiful, intricate designs. Also showing is a new line of delicate Contemporary Jewelry from State of A's German founder/designer Agathe Birtyl. Unusual Easter gifts, cards, new spring inventory, and—of course—Classic British Fare. Open Wed.-Mon. 11-6 and later for Gallery Walk. CLOSED FOR GALLERY WALK on April 5. In-Sight's new space has been transformed into a state-of-the-art facility with a full digital lab, darkroom, classroom, and much more. See the In-Sight website for program offerings and a gallery of selected student work. Public visiting hours: Mon.-Thurs. 10-6, Fri. 10-5. Additional lab hours are available for program participants. 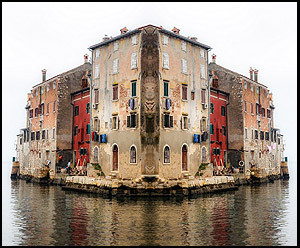 Featured through April 14 is Gene Parulis: Visions and Explorations, the artist's latest dye-infused aluminum prints. His continued fascination with digitally manipulated imagery leads us into places of stunning beauty and clarity; the always exquisite details serve his restless and relentless quest to heighten or magnify mystery, mood, and movement. Parulis' crafted worlds are totally credible as places we have—or would like to—visit and explore. Open Wed.-Mon. 11-5.... Opening on April 27 are David Rohn Watercolors.... Visit the MGFA Annex in the Brooks House Atrium, 132 Main St., for a rotating display of gallery artists. MGFA presents works in a variety of mediums to stimulate the seasoned collector and the aesthetic explorer. 5:30-6 pm · In a presentation entitled Songs of Peace from Asian Traditions, led by Larrimore Crockett, we learn a few songs from the Asian hymnal "Sound the Bamboo," gathered from countries such as India, Korea, Taiwan, and Japan. Larry is a retired UCC minister, singer, and choir director living in Dummerston. STUDENT ART: Two- and three-dimensional artwork by Brattleboro elementary school student is displayed throughout the building, including the SECOND FLOOR Entryway Case: Students' ceramic creations; and Children's Book Illustrators Cases: drawings by kids participating in Children's Room activities. MAIN FLOOR MEZZANINE WALLS: Bill Fleming's "Greetings from Brattleboro, VT" needlework. SECOND FLOOR Mezzanine Glass Cases: Loud Collection urns and sculptures. Objects from the Fine Arts Collection are permanently displayed throughout the building; take a self-guided walking tour during library hours: Mon.-Wed. 10-9; Thurs.-Fri. 10-6; & Sat. 10-5. The gallery features "Inktober," an exhibit of ink illustrations by Hermit Thrush resident artist Caitlin Stearns. Many came out of 2017's Instagram Inktober, challenging artists around the globe to create one ink drawing every day during October. Inspired by current events, powerful music and lyrics, Caitlin often draws a musician and writes down the lyrics while listening to their song. "It is a necessary cathartic release," says this New Jersey transplant with a BFA in painting. Caitlin is available for illustration and graphic design commissions—e-mail: caitlin.stearns16@gmail.com.... Pints of beer for Hermit Thrush Pint Night are available from 5 pm during Gallery Walk. Open Mon.-Thurs. 3-8, Fri.-Sat. 12-9, Sun. 12-6. Wheelhouse is now fully functioning as a studio, classes have started, and the gallery is taking shape. Other than during Gallery Walk, 5:30 to 8:30, hours are still somewhat by chance: Come by for a tour, sign up for a class (in person or online), and inquire about having a private Clay Play party. The gallery is currently showcasing all of Teta Hilsdon's pre-Wheelhouse work at half-price! The Silo Gallery features watercolors by John Dimick of Guilford, Vt. A native Vermonter, Dimick shares that his world view was developed by "years of running and hiking through the hills and fields and woods of Vermont. In my paintings I want to recreate the fleeting impressions that these experiences leave in my mind. The changes that the seasons bring to the landscape and the sounds and smells and organic textures of the outdoors inspire me."... Browse through informational brochures, magazines, maps, and exhibits of Vermont products, specialty foods, and fine crafts. Open 7 am to 11 pm.